Becoming a SHRM Certified professional is a challenging undertaking. Balancing work and personal commitments, along with preparing for the exam, requires you to study smarter. 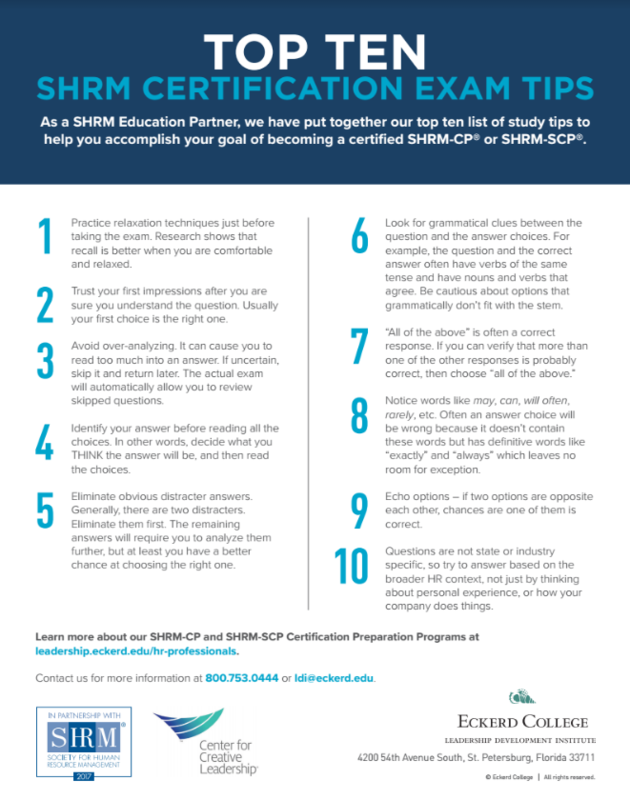 As a SHRM Education Provider, we have put together our top ten list of SHRM Exam tips to help you accomplish your goal of becoming a certified SHRM-CP® or SHRM-SCP®. Need more preparation for the SHRM Exam? This program, led by Terry Marschall, Senior Faculty Consultant and Senior Certified Professional (SHRM-SCP), helps you engage in stimulating discussions, learn from peers, and benefit from a structured environment that keeps you on track. Contact Customer Relations at 800-753-0444 to be notified when Fall 2019 dates are announced.